Janet M. Coffman, MA, MPP, PhD is Associate Professor at the Philip R. Lee Institute for Health Policy Studies and Department of Family and Community Medicine at the University of California, San Francisco. Susan A. Chapman, PhD, MPH, RN is Associate Professor at the Department of Social and Behavioral Sciences in the School of Nursing, and research faculty at the Center for Health Professions at the University of California, San Francisco. The Affordable Care Act will substantially increase the number of Californians with health insurance. Although health insurance provides people with important protection against catastrophic expenes, insurance alone is not sufficient to maximize health, especially for persons with chronic medi-cal, physical, and mental health conditions. Many persons with chronic conditions receive uncoordinated, episodic care. As a consequence, many of them undergo hospitalizations or emergency department visits that could be prevented if their conditions were managed better. The United States cannot hope to “bend the cost curve” unless it improves the manner in which care is delivered to persons with chronic conditions. The implementation of the recently-upheld Affordable Care Act (ACA) creates an opportunity to rethink how health care is delivered to persons with chronic conditions. In anticipation of the ACA, California has embarked on an initiative to improve coordination of care for senior citizens and persons with disabilities enrolled in Medi-Cal, many of whom also have chronic medical conditions. In June 2011, the Department of Health Care Services (DHCS) began transitioning senior citizens and persons with disabilities who are enrolled in Medi-Cal and are not dually eligible for Medicare into managed care plans for medical benefits in the 30 counties in which managed care is offered. In March 2013, California will begin implementing a demonstration project under which persons who are dually eligible for Medi-Cal and Medicare will be enrolled in managed care plans that will provide all health and social services, including In-Home Supportive Services (IHSS). Statewide an estimated 800,000 Californians will be eligible to enroll in these managed care plans (DHCS, 2012). These changes in the financing and organization of care raise the question of whether the health care workforce could be better deployed to meet the needs of senior citizens and persons with disabilties. Persons participating in IHSS are one group of Californians who might benefit from new models for utilizing home care workers. IHSS provides personal care services to low-income, elderly, blind, and disabled Californians age three years and older to help them remain in their homes. The IHSS caseload was 448,839 persons as of March 2012 (DSS, 2012). The program’s caseload doubled between 1999 and 2012 (DSS, 2012). Over half of IHSS consumers1 are elderly adults and over two-thirds are women (Newcomer and Kang, 2008). Eighty-five percent are dually eligible for Medicare and Medi-Cal (LAO, 2012b). In addition to needing help with basic activities of daily living (ADLs) and instrumental activities of daily living (IADLs), such as bathing, toileting, dressing, preparing meals, and providing transportation, IHSS recipients have an average of 3.41 chronic medical conditions. They also have high rates of hospitalization and emergency department visits (Newcomer and Kang, 2008). This concept paper explores the feasibility of creating opportunities for IHSS workers to play enhanced roles in providing care to their clients and to earn higher wages for fulfilling these roles. Currently there are no training requirements for personal care aides in California, and very few requirements in other states in the U.S. Even where training is required, it is typically limited to basic home care skills and falls short of preparing home care workers to provide health care related services and to function as a member of the health care team. With enhanced training, IHSS workers could become part of care coordination teams for IHSS recipients. They could help recipients manage their chronic conditions by assisting them with monitoring their health, administering medications, engaging in physical activity, and eating healthy foods. In addition, they could alert consumers’ primary health care providers and care coordinators promptly if consumers’ health conditions deteriorate. Such assistance could help to maximize consumers’ health and identify problems before they become severe and, thus, reduce hospitalizations and emergency department visits. IHSS workers are particularly well suited to assist with care coordination because they visit consumers in their homes multiple times per week and may be able to detect subtle changes in their conditions that are less visible to health professionals who see consumers less frequently (PHI and SEIU, 2012). This paper envisions that IHSS workers would have the option to obtain training to perform this enhanced role as care coordination assisters but would not be required to do so. Similarly, consumers could choose whether or not to hire IHSS workers with enhanced training. In the succeeding sections of this paper, we provide background information about IHSS and the persons it serves, the workers who care for IHSS recipients, an overview of existing models for expanded roles for home care workers, a discussion of the training IHSS workers would need to perform enhanced roles as care coordination assisters, and an analysis of the barriers and facilitators to implementing enhanced roles for IHSS workers. Meet all eligibility criteria for SSI/SSP except that their income is above the threshold for SSI/SSP eligibility (http://www.dss.cahwnet.gov/cdssweb/PG139.htm). County social workers assess recipients and determine the number of hours and types of IHSS services they need. Over 99% of persons who participate in IHSS are automatically enrolled in Medi-Cal and their IHSS services are paid for through Medi-Cal’s Personal Care Services Program (LAO, 2012a). Until recently most senior citizens and disabled persons enrolled in Medi-Cal, including IHSS recipients, received fee-for-service medical benefits. As noted previously, California began transitioning disabled persons in 30 counties who are enrolled only in Medi-Cal (i.e., not dual eligibles) into managed care plans for medical benefits in June 2011. An estimated 20,000 persons per month were enrolled in Medi-Cal managed care plans through May 2012 (LAO, 2012b). During fiscal year 2012-2013, DHCS will also enroll persons in eight counties who are dually eligible for both Medi-Cal and Medicare in managed care plans that will provide all health and long-term supportive services, including IHSS services (DoF, 2012). Beneficiaries in additional counties would be enrolled in 2014 and 2015 (DHCS, 2012). These developments could have substantial effects on IHSS because 85% of persons enrolled in IHSS statewide are dually eligible for Medi-Cal and Medicare (LAO, 2012b). The IHSS caseload has increased over the past two decades, rising from 225,000 persons in January 1999 to 448,839 persons in March 2012 (DSS, 2012). Data on recipients from 2005 suggest that most recipients are elderly (58%) or non-elderly adults (38%), although a small percentage of recipients (4%) are children with disabilities. Women account for 71% of recipients and are overrepresented among elderly and non-elderly adults who participate in the program. The program serves a racially/ethnically diverse population. Forty percent of recipients are white, non-Hispanic, 24% are Hispanic, 19% are Asian/Pacific Islander, 17% are African-American, and 1% are American Indian or Alaskan Native (Newcomer and Kang, 2008). Eighty-four percent of IHSS recipients who received fee-for-service Medi-Cal benefits in 2005 had a Medi-Cal claim for treatment of at least one chronic medical condition. The mean number of chronic medical conditions per IHSS recipient in fee-for-service Medi-Cal was 3.41 (Newcomer and Kang, 2008). 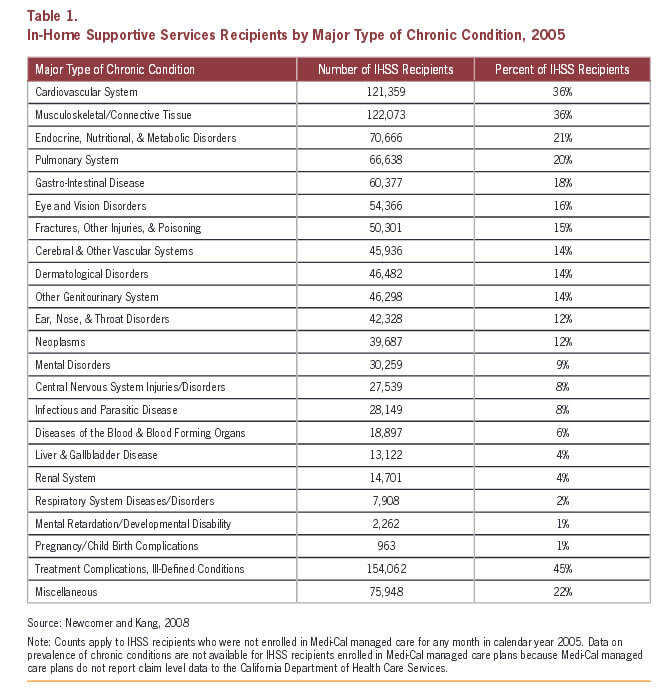 Table 1 (page 6) displays the numbers and percentages of IHSS recipients by chronic condition. The most common chronic conditions among IHSS recipients include cardiovascular conditions (36% of adult recipients), musculoskeletal/connective tissue conditions (36% ), endocrine, nutritional, and metabolic conditions (21%), and pulmonary conditions (20%). Common cardiovascular conditions include hypertension, congestive heart failure, and chronic ischemic heart disease. The most prevalent musculoskeletal/connective tissue conditions among IHSS recipients include arthritis, osteoporosis, and disorders of the spine or spinal discs. Most recipients with endocrine, nutritional, and metabolic conditions had diabetes with or without renal, peripheral vascular, neurological, ophthalmologic, or other complications. Common pulmonary conditions include chronic obstructive pulmonary disease and asthma (Newcomer and Kang, 2008). This high prevalence of chronic conditions among IHSS recipients contributes to their high rates of use of emergency rooms and hospitals. Across all age groups, over half of IHSS recipients who received fee-for-service Medi-Cal benefits in 2005 had at least one emergency department visit that year (52% of elderly adults, 59% of non-elderly adults, and 57% of children) compared to about 21% for the general U.S. adult population in 2010 (NCHS, 2011, pg. 309). Data from 2005 also indicate 27% of IHSS recipients over the age of 65 who received fee-for-service Medi-Cal benefits were hospitalized at least once that year, as were 23% of non-elderly adults and 13% of children. This compares to 16% for the general U.S. adult population over age 65 in 2010, 6-8% for non-elderly adults and 2% for children (NCHS, 2011, pg. 328). IHSS recipients who had breathing limitations, had more health conditions, or had three or more limitations of activities of daily living were more likely to be hospitalized or to visit the emergency room (Newcomer and Kang, 2008). Among IHSS recipients who were hospitalized at least once, 29% were hospitalized for an ambulatory care sensitive condition (i.e., a health condition for which hospitalization may have been avoidable if the patient had obtained appropriate outpatient care (Newcomer and Kang, 2008). Examples of ambulatory care sensitive conditions include asthma, bacterial pneumonia, chronic obstructive pulmonary disease, congestive heart failure, diabetes, hypertension, and urinary tract infections.2 These high rates of hospitalization for ambulatory care sensitive conditions are consistent with findings from a national study of Medicaid home and community based services (Konetzka et al. 2012). There are several classifications of workers who work in the home. These groups of workers vary in name and also in training requirements, certification, and the type of organizations or clients for whom they work. Home health aides are required to have a minimum of 75 hours of training, be certified by a state agency, and typically work for a Medicare and Medicaid certified home health care agency under the supervision of a registered nurse. Home care workers, the focus of this brief, are also known as personal care aides, personal support workers, and direct care workers. They are often in-dependent workers hired directly by a consumer or family member, or they may be listed on a registry of available workers. The demand for home care workers is growing nationally and in California. The U.S. Department of Labor, Bureau of Labor Statistics (BLS) projects a 70% growth rate in this occupation in the next decade (U.S. DOL, 2012). In California, personal and home care aides top the list of occupations with the most job openings, with over 200,000 job openings between 2008-2018. ‘Personal and home care aide’ is the third fastest growing occupation in California with a 46% projected growth rate in the next decade. By 2018, there are projected to be over a half million personal and home care aides employed in California (State of California, EDD, 2012). These figures do not likely include IHSS workers who are family caregivers (Newcomer and Kang, 2008). They also do not account for the hours of unpaid informal care provided by family and friends. According to the California Association of Public Authorities for IHSS, California’s IHSS program employs more than 350,000 workers (CAPA, 2012). Employment arrangements for IHSS workers differ markedly from those of most health care workers. Consumers participating in IHSS are responsible for hiring, training, supervising, and firing their IHSS workers. Some counties maintain registries of IHSS workers from which recipients may select pre-screened candidates. Other counties have employees who perform IHSS services or contract with organizations that provide IHSS services. In California, recipients may hire friends or family members. Data on IHSS recipients collected in 2005 indicate that 56% of IHSS recipients obtain services from a parent, spouse, or other relative and that 44% obtain services from non-relatives (Newcomer and Kang, 2008). The relationship between the recipient and caregiver varies widely across age groups. In 2005 non-elderly adults (47%) and elderly adults (45%) were much more likely to receive services from non-relatives than children (16%). IHSS is funded by county, state and federal dollars. Workers’ paychecks are issued by the State of California. Public authorities at the county level are the employer of record for IHSS workers. Wages and benefits vary across California’s counties. In May 2012, wage rates ranged from $8.00 per hour in 9 rural counties to $12.20 per hour in Santa Clara County (CAPA, 2012). Wages are generally higher in counties in the San Francisco Bay Area than in other parts of the state. IHSS workers are represented by several unions: the Service Employees International Union (SEIU) (300,000 members), the American Federation of State, County and Municipal Employees (AFSCME) United Domestic Workers (65,000 members), and California United Homecare Workers, a joint Local of SEIU and AFSCME (20,000 members) (AFSCME UDW, 2012; CUHW, 2012; SEIU, 2011). In California, as in most states, there are no formal requirements for training or state certification for home care workers. However, some home care agencies or registries require limited training. These are not “accredited” training programs, as in other health professions. Thus, training may vary from a few hours to a longer training comparable to the 75 hours required for home health aide training in California. In recent years, some stakeholders have become interested in improving training for home care workers. For example, educational organizations affiliated with unions that represent home care workers in California and Washington have developed training programs for these workers. Nationally, the federal government awarded grants to six states, including California, to develop a standardized curriculum and competency assessments (U.S. HHS, 2012). However, even the most comprehensive training program for home care workers is focused primarily on basic personal care services and does not prepare the worker to play a significant role in consumers’ health care teams. As DHCS and the Legislative Analyst’s Office recently noted, under the current system of care, seniors and persons with disabilities who are enrolled in Medi-Cal must coordinate their own medical and long-term supportive services, including IHSS, or find someone who can assist them in doing so (DHCS, 2012; LAO, 2012b). IHSS recipients’ medical care providers have no clear obligation to coordinate their care and have varying levels of ability and interest in doing so. Coordination is especially challenging for IHSS recipients with multiple chronic conditions, especially conditions with complex treatment regimens, such as diabetes. Some IHSS recipients have disabilities, such as cognitive impairments or hearing or vision loss, which may make it difficult for them to coordinate their own care. Others may not have relatives or friends who can coordinate their care for them. For such persons, having an IHSS worker who is trained to serve as a member of a care coordination team could improve the timeliness and quality of the care they receive. Enhanced roles for IHSS workers as care coordination assisters could involve several functions, including monitoring and observing the client for signs and symptoms that require medical intervention, such as high blood pressure, high blood sugar, or difficulty breathing. IHSS workers in an enhanced role could also be skilled in delivering a limited number of medical interventions specific to the needs of their IHSS clients, such as medication administration, assistance with physical therapy, and wound care. In addition, IHSS workers in an enhanced role could help clients obtain proper nutrition and exercise. IHSS workers also may be able to detect changes in clients’ conditions more quickly than other members of the health care team, because they care for them in their homes multiple times per week (PHI and SEIU, 2012). IHSS workers serving in an enhanced care coordination role would need to be skilled in effective and assertive communication with other members of clients’ health care teams. They would also need to develop relationships with clients that facilitate candid, open conversations about their needs and clinicians’ recommendations for managing their conditions (PHI and SEIU, 2012). Care coordination assisters should also understand and learn how to work within the health care system to meet the needs of their clients. This includes how to access care at the right level, from the right health care team members, and in a timely manner. The need for IHSS workers who are trained to serve in an enhanced role as members of clients’ health care teams varies across IHSS recipients. IHSS’s longstanding emphasis on consumer choice should be preserved when implementing enhanced roles for IHSS workers. Younger consumers with spinal cord injuries who are otherwise healthy may prefer to coordinate their own care and to train their IHSS workers to meet their particular needs. Parents of children participating in IHSS may prefer to coordinate directly with their child’s clinicians instead of relying on a paid caregiver to do so. The IHSS recipients most likely to benefit from having an IHSS worker with enhanced training in care coordination assisting are consumers with chronic conditions who have high expenditures for emergency department and inpatient care and/or are at high risk of nursing home placement. Providing a higher level of care for these IHSS recipients in their homes may also reduce the overall cost of caring for these recipients. Few models for preparing home care workers to serve in enhanced roles as care coordination assisters are available. Most models of care coordination only address coordination of primary care and acute care (PHI and SEIU, 2012). However, this knowledge gap is closing as two new grants to the Service Employees International Union-United Long Term Care Workers (ULTCW) are implemented. As DHCS began developing plans to transition senior citizens and persons with disabilities enrolled in Medi-Cal from fee-for-service to managed care, ULTCW saw an opportunity to upgrade the skills of IHSS workers by preparing them to become a more active member of the health care team. is a community health center that provides care at multiple sites in East and South Los Angeles. Under this grant, ULTCW anticipates training 90 IHSS workers over the course of 1.5 years. The Center for Medicare and Medicaid Innovation subsequently awarded a $11.8 million grant to the California Long-Term Care Education Center (CLTCEC), a 501(c)(3) associated with ULTCW, to train and integrate 6,000 IHSS workers in Contra Costa, Los Angeles, and San Mateo counties into care coordination teams (Andrea Edmiston, ULTCW, personal communication, July 6, 2012). For both projects, training will be conducted with a sample of volunteer IHSS consumers and their workers, along with willing health care provider teams. The content will be developed in consultation with IHSS consumers, IHSS workers, clinicians, community health educators, and other stakeholders. Topics are likely to include activities of daily living, CPR/First Aid certification, mobility, Alzheimer’s and dementia, infection control, nutrition, and communication skills, among others (Andrea Edmiston, ULTCW, personal communication, July 6, 2012). Upon completion of training, IHSS workers will be integrated into clients’ care coordination teams through in-person meetings with their primary care physicians and follow-communication. It will be important to evaluate pilots such as these so that the findings can be used to inform the rolling out the enhanced role for home care workers on a larger scale in California. St. John’s and ULTCW plan to enroll three successive cohorts of IHSS workers and clients in the Los Angeles County pilot, a design which will provide time to assess and improve the program prior to enrolling subsequent cohorts. Multiple indicators will be used to evaluate the pilot program, including IHSS workers’ knowledge and self-efficacy, the proportion of clients’ medical visits attended by their IHSS workers, frequency of contact between IHSS workers and case managers, rates of hospitalization, adherence to medication regimens, and clients’ health status, functional status, quality of life, and satisfaction (Andrea Edmiston, personal communication, July 6, 2012). In addition, SB 1036, a trailer bill for California’s budget for fiscal year 2012-2013 that was signed by the Governor on June 27, 2012, includes provisions for the establishment of a statewide training curriculum for IHSS workers. The curriculum would be developed by DSS with input from stakeholders. The training would be voluntary and would not be funded through the state General Fund. Nevertheless, this bill is the first legislation in California to establish standards for IHSS worker training and could provide a platform for developing a state-wide model for training to perform an enhanced, care coordination role that would build on a basic curriculum for all IHSS workers. The lack of models for enhanced roles for home care workers in care coordination makes it difficult to predict the impact of enhanced roles on IHSS clients’ health outcomes. Most care coordination interventions that have been evaluated to date have not included home care workers as members of the health care team. A recent review by the Congressional Budget Office found that six major Medicare demonstration projects that used nurse care managers to provide care coordination and disease management have had inconsistent effects on hospital admissions and expenditures and little impact on process of care measures, such as receipt of recommended preventive services (Nelson 2012). The programs that had the largest effects on hospital admissions involved substantial direct contact between care managers and physicians and/or substantial in-person contact with clients. This finding suggests that a model of care coordination that encompasses both care managers and IHSS workers in an enhanced role may reduce hospital admissions among IHSS clients. IHSS workers interact with clients in-person multiple times per week, enabling them to observe clients’ conditions frequently and to help care managers assure that clients are taking medications as directed and receiving other recommended treatments. Improvements in medication management alone could yield substantial reductions in inpatient admissions and emergency department visits (Roebuck et al., 2011). The feasibility of implementing an expanded role for IHSS workers as care coordination assisters hinges on a number of factors. Much will depend on changes already occurring in health care in California and the nation as well as the decisions DHCS and the California State Legislature make about the program’s future. Organizations in California that are interested in implementing enhanced roles for IHSS workers in care coordination assisting will need to review all laws and regulations that might affect implementation of this model (PHI and SEIU, 2012). Examples include Medi-Cal regulations, licensure and scope of practice laws for health professionals, and liability laws. Advances in technology may facilitate an expanded role for IHSS workers in care coordination. The widespread availability of Internet connections through mobile and stationery devices could be harnessed to enable IHSS workers to report blood pressure, blood sugar, and other vital signs to other members of clients’ health care teams on a daily basis. Such information could facilitate closer monitoring of recipients and more prompt intervention when their health deteriorates. Computer applications could also be used to record and share information about diet and physical activity. When IHSS recipients are ill, IHSS workers could also use computer technology to receive advice from clinicians on IHSS recipients’ health care teams as to whether the illness can be managed in the home without an office visit or a trip to the emergency department (e.g., distinguishing a virus from a bacterial infection). Computer technology could also be used to augment in-person mentoring and oversight of workers. Organizations responsible for administering IHSS services would need to provide workers with devices that could be securely connected to the Internet, train workers to use these devices to transmit information, and provide technical support when workers encounter difficulties using these devices. IHSS workers would need an incentive to pursue training in care coordination assisting. Providing higher wages to workers with training in care coordination assisting would be an especially powerful incentive. The opportunity to earn higher wages would signal to all IHSS workers the potential for a career path within IHSS and provide tangible rewards to workers who complete training. However, obtaining resources to support higher wages for IHSS workers trained in care coordination assisting would be challenging. Funding for IHSS is limited and the program is often targeted for budget cuts. California’s budget for 2012-2013 includes a 3.6% reduction in the number of hours of IHSS services that recipients may receive (DoF, 2012). In addition, historically IHSS and other long-term supportive services have been funded separately from medical care (DHCS, 2012). IHSS is funded by Medi-Cal and counties, whereas Medicare covers most medical expenses for the 85% of IHSS recipients who are dually eligible for Medicare and Medi-Cal. The separation of funding for medical care and long-term supportive services creates a disincentive for rewarding IHSS workers for obtaining training in care coordination assisting. The cost of increasing wages for IHSS workers would be incurred by the Medi-Cal and by counties, but any savings associated with reductions in emergency department visits and hospitalizations for dual eligibles would be realized primarily by the Medicare program. (LAO, 2012b). Incentives regarding investment in IHSS workers may change now that California has embarked upon an initiative to enroll persons who are dually eligible for Medicare and Medi-Cal into managed care organizations that will be responsible for all medical and long-term supportive services provided to this population (DoF, 2012). The initiative will begin with a demonstration project under which eight counties will begin enrolling dual eligibles in managed care in March 2013 (DHCS,2012). Beneficiaries in additional counties will be enrolled in 2014 and 2015. Statewide an estimated 800,000 Californians will be eligible to participate in the demonstration project (DHCS, 2012). Eligible persons will be automatically enrolled in the demonstration unless they choose to opt out. County social workers will continue to determine eligibility for IHSS and to authorize the number of hours of IHSS services recipients may receive. IHSS consumers would retain the right to hire, direct, and fire their IHSS workers (DHCS, 2012). Managed care organizations enrolling dual eligibles will have an incentive to provide care to IHSS recipients in the least costly setting. DHCS envisions that multi-disciplinary teams of health professionals will work with one another to improve utilization of homeand community-based services and minimize hospitalizations and nursing home admissions (DHCS, 2012). Having IHSS workers who are trained to assist with care coordination could help managed care plans control costs for IHSS recipients with chronic conditions. Such IHSS workers could help recipients adhere to recommended treatments and could contact care managers or clinicians promptly if their health worsens, which could reduce the need for emergency department visits and hospital admissions. Better management of chronic disease could also reduce or delay nursing home admissions. The success of an enhanced role for IHSS workers in care coordination assisting will depend in large part on how health professionals understand the care coordination assister role and utilize IHSS workers’ knowledge of recipients’ needs. Health professionals may be reluctant to communicate with IHSS workers, particular those who are not close relatives, about their recipients’ conditions due to concerns about privacy. Some may also not understand or value IHSS workers’ knowledge of recipients’ habits, symptoms, and adherence to recommended treatments. Health professionals caring for IHSS recipients would need to be educated about the value of home care in general as well as the enhanced, care coordination assister role. They would also need some means for identifying IHSS workers serving in this enhanced role. Training in effective communication would be important for all members of the health care team, including clinicians, IHSS workers, and family caregivers. Oversight and mentoring of IHSS workers serving in an enhanced, care coordinator role would also be critical. Traditionally these workers work one-to-one with an IHSS recipient with little to no supervision or mentoring. Workers who serve in enhanced roles as care coordination assisters would benefit from mentoring from clinicians with expertise in chronic disease management. The care coordination assister model could build in an ongoing mentoring component beyond training and should include a clear mechanism for accountability in the care coordination assister role. To preserve the principal of consumer choice, IHSS consumers should remain involved in the hiring, firing, and supervision of IHSS workers. will provide more guidance for future implementation of this enhanced home care worker role and improve quality of care for IHSS recipients. Konetzka RT, Karon SL, Potter DEB. Users of Medicaid Home and Community-based Services are Especially Vulnerable to Costly Avoidable Hospital Admissions. Health Affairs (Millwood), 2012;31(6):167-1175. Newcomer R, Kang T. Analysis of the California In-Home Supportive Services (IHSS) Plus Waiver Demonstration Program. Washington, DC: US Department of Health and Human Services, 2008. PHI and Service Employees International Union (SEIU). Innovations in Care Coordination: Re-thinking the Role of Home Care Workers. Washington, DC: PHI and SEIU, 2012. Roebuck MC, Liberman JN, Toyama M, Brennan TA. Medication adherence leads to lower health care use and costs despite increased drug spending. Health Affairs (Millwood), 2012;30(1):91-99. U.S Department of Health and Human Services, Centers for Disease Control and Prevention, National Center for Health Statistics (NCHS). Health, United States, 2011: With Special Feature on Socioeconomic Status and Health. Hyattsville, MD: CDC, 2012. Newcomer and Kang (2008) used the Agency for Healthcare Research and Quality’s Pediatric Quality Indicators and Prevention Quality Indicators to identify ambulatory care sensitive conditions. These indicators are widely used to assess the quality of care provided to children and adults. facilitators to implementing an expanded role for IHSS workers.